If I were really telling the truth about this story, I would tell you how alone I felt back then. How I'd started thinking that the kind of partnerships I dreamed of were just that--pipe dreams. I would tell you that I did the Finding Your Voice course largely on my own, even though I can't stand working that way, because it was getting me through a hard winter. And it took half a dozen friends to hold me together. Liz draws me for "Telling Your Story"
I thought about people who felt soothing to my soul, and Liz Kalloch was one of the first people to come to mind. I was trying to figure out a way to see her and spend more time with her, (we met at Squam and she lives on the other coast) and she said, "It would be really fun to create a project together". It was like when you've had a really bad fall on the sidewalk, and you're sitting there staring at your bloody knees, too sore and dazed to try standing, and someone stops and reaches out her hand. I remember talking to Jen Gray back then, telling her how I received Liz like a gift from the gods. She said, "Liz Kalloch is an earth angel," and I said, "Oh my god, YES. That is EXACTLY what she is." Plenty of people are talented, but not everyone is kind. Plenty of people can do the work, but not everyone can do the work in love. And for me, the kindness and love are everything. I wanted Telling Your Story to have as much visual beauty packed into it as possible, so we came up with this idea for Liz to do line art based on the photographs that were going into the project. The simplicity of her pieces, along with the subtle repetition, really infused the whole curriculum with visual interest without making it feel too busy. We even added her work to the "blank" pages in the back that can be inserted throughout the 3-ring binder wherever they are needed. She was my design consultant for the project as I put together the layout, working the cover with me and doing the entirety of the Telling Your Story Sound Studio design this fall. The other idea we cooked up all those many many months ago was a new print edition of The Care and Keeping of Creative Souls manual I'd written and taught from last fall. It would feature Liz's original line art drawings, my full-color photos and some new writing. The final result is so exquisite to hold in your hands that people literally go speechless for a moment when I hand it to them. Back cover: The Care and Keeping of Creative SoulBy now we have so many good things cooking, I can hardly stand it. Liz is my vision catcher, my collaborator, my magic-maker and dear friend who talks me down from the tree. I couldn't be more honored to be on this journey with her, hand-in-hand, or more thrilled to share her and her work with you. Liz Kalloch has been dancing to her own beat from an early age, when she thought the Brownie badges were ugly and made her own. (So clever, and yet so unappreciated by her troop leaders.) Her creativity bursts forth through more mediums than we can name here, but her greatest work is what she creates out of love, friendship, beauty and an adventurous heart. 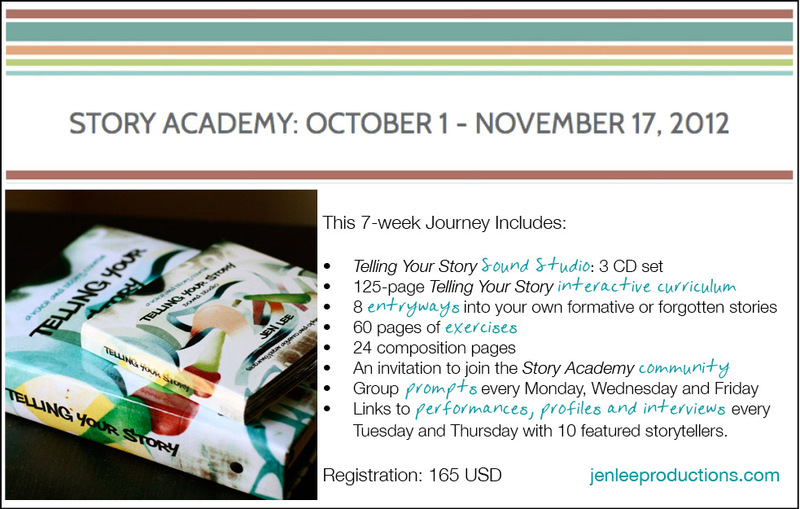 When putting together the Telling Your Story course, I wanted to add interviews with some of my friends--people who were not only amazing storytellers themselves, but who also had experience teaching storytelling. I loved the idea of working with Peter and Ophira, and giving us a chance hear from someone from a comedy background and someone from an improv background, to explore how our varied experiences impact the way we approach the art and craft of this medium. Also, I will own up to some purely selfish motivations: there were some conversations I was longing to have, conversations that don't happen standing in line for a show or hanging out in a crowded bar afterward. There were questions I wanted to ask these two that really require a quiet room, the chance to sit face to face, cozy into your chair and really be listened to. Ophira Eisenberg is a celebrated comic who has appeared on Comedy Central and was named a "Top Ten Comic" by New York Magazine. I've always been drawn to Ophira because she's so damn real. So much of the time when she makes me laugh, it's this laughter of surprise because she has said something so honest, and so previously unrecognized or unnamed that I'm like, "Oh my god it's so TRUE!" She has this astute observation and this willingness to own up to all kinds of things that simultaneously inspires me and makes me feel relief at not being "the only one". A lot of people can rock a persona or a character on stage, but it takes something else entirely to stand in front of a crowd and a microphone, under a spotlight and just be true. Ophira is the real deal, all the way, and it's no surprise that she is so beloved in our community. I love that her Sound Studio interview gives us a behind-the-scenes look at how she navigates vulnerability and how she prepares stories with high emotional content. Whenever I think about the way that love makes us brave, I think about The BTK Band. The improvisational storytelling rock band, led by Peter Aguero, is my favorite to stand on stage with when I'm telling the stories that are hard to tell. They're the ultimate safety net--I know I won't lose their affection, even if I swing out wide and fall, and there is literally no where I can go that they won't go with me. I wanted TYS participants to feel that same safety, that same sense of bold permission, and having Peter collaborate on the project was the perfect way to create that. Peter really embodies this mix of badassery and tenderness that gives me hope for my own budding inner baddass. In his sound studio interview, he gives participants the full range, addressing fears with compassionate, bold advice. He shares about the stories that have changed him forever and what gets lost when we hold back. We recorded the Sound Studio first, in December 2010, and as I designed and finished the interactive curriculum I did my best to infuse the whole project with the spirit and sensibilities of Peter and Ophira, just as much as my own. The result is that this project is more urban and more rock and roll than anything I've previously produced. It's really an hommage to the NYC storytelling community, featuring photos of some of our favorite venues and quotes and wisdom from the friends and mentors that have taught me everything I know about the art and craft of storytelling. There is no greater gift than working in the company of friends, and creating the Telling Your Story course with Peter and Ophira was nothing short of a dream come true. You can find Ophira's comedy album, As Is, on iTunes. Her memoir, Screw Everyone: Sleeping My Way to Monogamy, will be available through Perseus Books in Spring of 2012. The BTK Band can be found causing trouble the second Monday of every month, Under St. Mark's Theater. Peter and I will be together again for BARE on December 29th.